Hello friends!! I am having a scrapping weekend with some of my local scrappy friends at the Scrapbook USA Expo and Archivers this weekend. I had a chance to get this card made for CPS Sketch 210 this week and the Moxie Fab World - Cityscapes Are On The Rise Challenge and I wanted to share it with you today. I hope that you are having a great weekend!! I am sure enjoying mine. Thanks for stopping by!! Very nice! I love all the patterns against the kraft background...and that compass is awesome! Very nice! The paper you chose is fantastic. Love the way you used Basic grey's wanderer on your card. 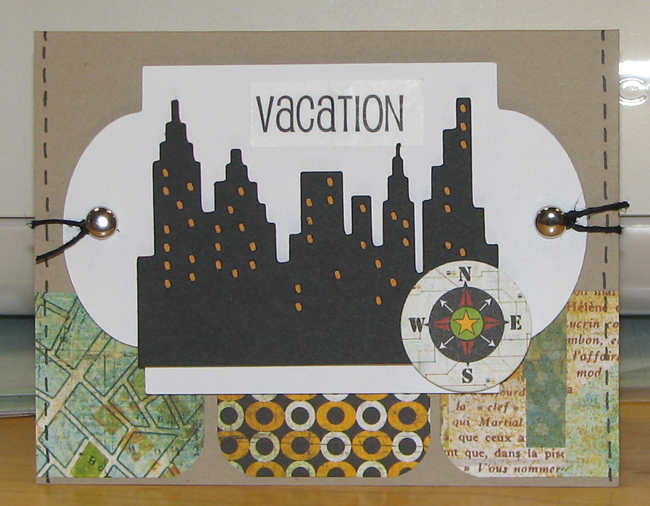 The patterns complement the kraft and the cityscape so well.